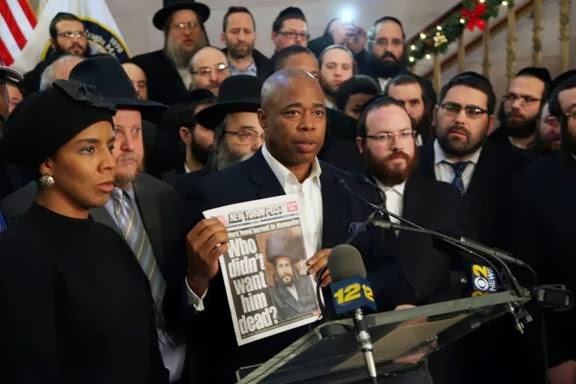 Borough President Eric Adams joined Jewish community leaders and local elected officials on Sunday, Jan. 5 to condemn the New York Post's hateful coverage of the murder of Menachem "Max" Stark, a 39-year-old father of eight children from the Chasidic community of Williamsburg. Along with reporting that alleged him to be a crooked slumlord, the Post's cover featured a picture of Stark next to the headline, "Who didn't want him dead?" "We stand as One Brooklyn in condemnation of the New York Post's coverage of the murder of Menachem Stark," said Borough President Adams. "Above all else, this was a husband, a father and a member of a community that sits in mourning over his tragic passing. The New York Post's decision to hang him in effigy on the cover of today's paper, just hours after his family has begun to sit shiva, is a betrayal of the journalistic integrity that its readership deserves. I am calling for the New York Post to publish a formal apology to the Stark family in tomorrow's paper." Elected officials in attendance included Public Advocate Letitia James, Assembly Member Joe Lentol, Council Members Laurie Cumbo, Chaim Deutsch, David Greenfield, Steve Levin and Mark Treyger as well as Rockland County Legislature Majority Leader Aaron Weider. "I condemn in the strongest possible terms the incredibly insensitive and crass cover of today's New York Post which mocks the kidnapping and brutal murder of Menachem Stark," said State Senator Simcha Felder. "The Post must issue an immediate apology to the Stark family and to all New Yorkers for its egregious behavior and failure to exercise any judgment whatsoever in this matter." "I am disgusted that the New York Post condoned the murder of a businessman, husband and father of eight," said Greenfield. "This clearly crosses the bounds of decency and demands an immediate apology from the newspaper to the grieving family and the entire community. The murder of an innocent man is not something to be celebrated in New York City. It's a horrific tragedy and the Post's coverage of this death is borderline anti-Semitic." "The New York Post's unbelievably offensive headline this morning comes the day after Mr. Stark's family and children, as well as an entire community, laid him to rest and are still mourning his death," said Levin. "For the New York Post to suggest that a person deserved to be murdered is sickening and reaches a new low. The entire community is outraged by such a vulgar headline that is so offensive and horrific. The New York Post should pull their story and issue an apology to the family and community that are still in mourning." Jewish community leaders in attendance included Chair Yidel Perlstein of Community Board 12, Rabbi David Niederman of the UJO of Williamsburg, Rabbi Yeruchim Silber of the Boro Park Jewish Community Council (JCC), Shea Rubinstein of the JCC of Marine Park, Rabbi Moshe Indig of the JCC of Williamsburg, Rabbi Chanina Sperlin of the Crown Heights JCC, Meny Hoffman of Bonai Olam, Jacob Itzkowitz of the Williamsburg Shomrim, Yanki Daskel of the Boro Park Shomrim, Rabbi Abe Friedman of Williamsburg and Rabbi Joel Eisdofer of Boro Park. They announced a $10,000 reward for information leading to the arrest and conviction of those responsible for the murder of Stark, whose smoldering body was found in a dumpster in Long Island, following his abduction Thursday night outside his real estate office in Brooklyn. "As a real estate consultant who dealt with Max Stark and his partnership, I can say that this was a honest, humble man of integrity in the business community," said Joel Friedman, a Williamsburg community activist. "The New York Post has crossed a dangerous line, recklessly prejudicing a criminal investigation and deeply offending a grieving family and an entire community," said Indig. "Whatever the facts turn out to be and whatever the full story as established by the police, children have lost their father and a wife is now a widow. To have a front page story essentially declaring 'who didn't want this man dead?' is an affront to all New Yorkers. The Post and its parent company owe us all an apology." "A family mourns today. A community mourns today. And I, as a New Yorker, mourn today," said Rubenstein. "The New York Post's irresponsible reporting, suggesting that these cold-blooded murderers did society a favor, further encourages such a callous attitude toward the value and sanctity of human life." "This is not the first time that the New York Post has had the audacity to use deplorable language to depict against our community," said Marc Katz of the Boro Park Shomrim. "This is an unacceptable way to treat fellow Americans and should not be tolerated. The paper should be banned from ours and neighboring communities." Brooklyn Borough President Eric Adams holds a copy of the New York Post edition, which featured a picture of Menachem "Max" Stark next to the headline, "Who didn't want him dead?" at a press conference at Borough Hall which condemned the Post's coverage of Stark's murder; he was joined by Jewish community leaders and local elected officials including (from left to right) Council Member Laurie Cumbo, Rabbi Chanina Sperlin of the Crown Heights Jewish Community Council (JCC), Rabbi David Niederman of the UJO of Williamsburg and Meny Hoffman of Bonai Olam. Investigators are persuing indications that the abductors were people to whom Stark owed money, and that they wanted to scare him into paying up by sitting on him, accidentally causing him to suffocate. They then tried to dispose of the body. If this was the case, they clearly didn't want him dead.